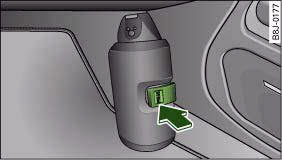 The factory-fitted fire extinguisher is located in the footwell on the front passenger's side (secured in a holder). – Unfasten the retaining strap by pressing on the tab marked “PRESS” ⇒ fig. 266 -arrow-. – Take the fire extinguisher out of the holder. – Place the fire extinguisher in the holder. – Secure the fire extinguisher with the retaining strap. – Have the fire extinguisher refilled and checked by a qualified dealer or the fire service. Check how the fire extinguisher works before you need to use it. The instructions for use are shown on the fire extinguisher. Have the fire extinguisher checked regularly (at least every two years) by a qualified dealer or by the fire service to ensure that it will be in working order when you need it. When buying a new fire extinguisher, make sure it fits in the holder. If the fire extinguisher is not secured properly it could be catapulted through the vehicle during driving and braking manoeuvres or in the event of an accident. This poses a risk of injury to occupants. • The fire extinguisher must comply with legal requirements. • Observe the expiry date of the fire extinguisher. The fire extinguisher may not work properly after the expiry date.